Florence is one of the most beautiful cities in Europe and is an ideal place to study architecture, art, and design. The city has more than 100 museums devoted to the fine arts; and the city center is a museum in itself, filled with meticulously preserved architecture dating from the Middle Ages and the Renaissance. Through Kent State’s College of Architecture and Environmental Design (CAED) in Florence, students will encounter the rebirth of architecture in Europe and witness in person the historical evolution of European art, interior design, and urbanism – including the opportunity to explore the contemporary art and design scene in Italy. Kent State University has been educating students in Florence for more than 40 years. Home to the program is Palazzo Vettori, a prestigious and ancient building located in the very heart of Florence, at the corner of Via Cavour and Via Alfani, next to Piazza del Duomo. According to historian Guido Carocci, the fabric of the building started at the beginning of the 15th century. Its façade proclaims the new ideas of Renaissance architecture based on the use of rustication. 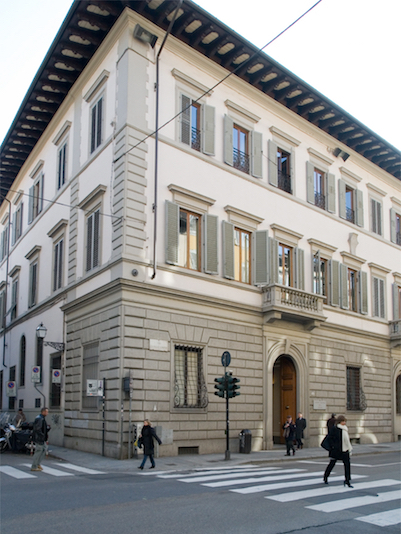 Starting January 2016, Palazzo Vettori is the new home to the Kent State University Florence program. Palazzo Vettori is located within walking distance from the Duomo and from Piazza San Marco. Paola Giaconia is coordinator for the Architecture and Interior Design Programs at Kent State University Florence. The Adventure of a Lifetime You’ll live and study in one of the most beautiful and historic cities on earth, walking the same stone streets Michelangelo, Galileo, and Dante walked. And Italian food is amazing – you will be surrounded by the best pizza, fresh pasta, gelato, prosciutto, espresso, panini… But that’s just while you’re in class Monday through Thursday. You also have long weekends to explore Europe, maybe Paris, London, Barcelona, or a medieval village in the Tuscan countryside. You could spend Thanksgiving in Ireland or spring break in Santorini – it’s your adventure!